“The urge to write about Peru first came to me when I was ill and bedridden, aged 30, at Ollantaytambo,” says Ronald Wright, author of The Gold Seekers. “It’s where Manku, the Inca resistance leader–and a hero in The Gold Eaters–routed a Spanish army in 1536.” After convalescing there at a small hotel called El Albergue, Wright began working on what became his first book, Cut Stones & Crossroads: A Journey in Peru–reissued in Penguin Modern Classics with a foreword by Alberto Manguel. 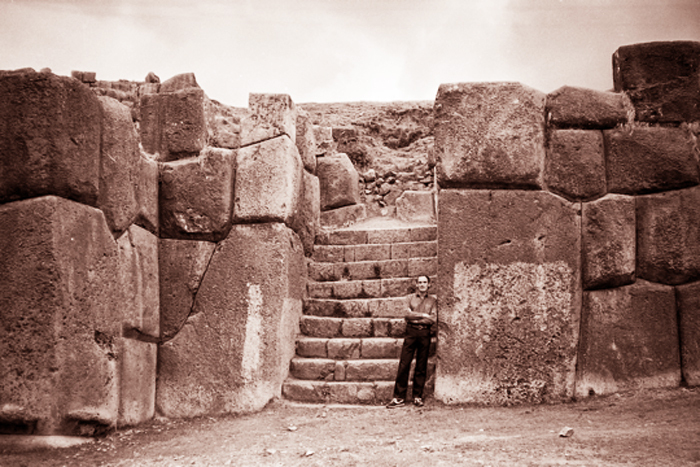 Ronald Wright at the Inca fortress at Cusco. Photo by J.Rod Vickers. The initial raid on an Inca vessel at the outset of the novel actually occurred and a young boy was kidnapped and taken to Spain. Very likely he later served as the interpreter for the Spanish in Cajamarca and Cusco, two of the main Peruvian cities featured in the book. The architects of Machu Picchu and Cusco were part of an advanced civilization but unfortunately they did not have guns or a deadly disease to do their dirty work. The ransom for the Inca emperor, Atawallpa, was a roomful of gold and silver, seven tons of gold and 13 tons of gold all melted down. But when the ransom was delivered, Pizarro betrayed Atawallpa and killed him anyway. “We can probably never get enough of writings that set to rights the looting and devastation that wreaked havoc on ancient civilizations under the guise of bringing Christianity to the savages. “Luisa Maria Celis’s novel about the Spanish conquest of Venezuela, Arrows, which I reviewed in BCBW in spring, 2009, was a product of meticulous research. The author read over 90 books, blasting light on the atrocities under Diego de Losada, one the Spanish invaders in Venezuela’s Caracas Valley during Spain’s “Golden Age” in the mid 16th Century, around 40 years later than Pizarro’s rampages. 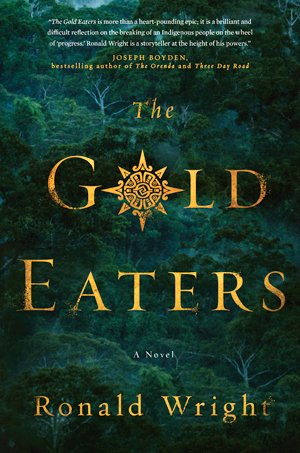 “Now Ronald Wright has followed suit with a remarkable New World tale of glory, gore and gold, The Gold Eaters (Penguin Group – Hamish Hamilton Hardcover, $32) , written after Wright has made numerous trips to South America, conducting research. “Under these authors’ unblinking eyes, the glorified Spanish Conquistadors look a whole lot more like thugs and thieves. The amazed Incas called them ‘gold eaters’ because they fell on the gold with such hunger and savagery. “That Wright’s action-packed plot is largely based on meticulous research and historical characters makes it all the more fascinating. “The driving narrative tells the tale of the vast sweep of Pizarro’s invasion of the rich and advanced Inca kingdom. Over 3,000 miles long and stretching from southern Columbia to central Chile, the empire was the world’s second largest after China. 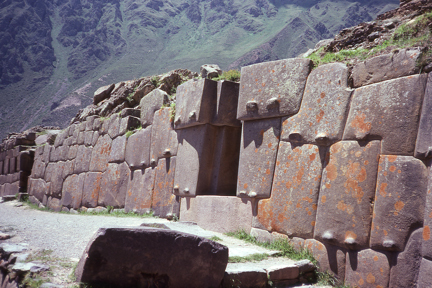 Ruins at Ollantaytambo, intended function unknown. Ronald Wright photo. “Abetted considerably by the devastating smallpox they brought with them, by deceit and by the Inca’s trusting nature, Pizarro, a founder of Panama, loots and slaughters his way to Cusco’s gold. “Before him, in 1521, Hernán Cortés had just conquered Mexico, with the help of his invisible army, the smallpox. Now Pizarro wants the gold of the last great unknown civilization to the south. So it is that in 1526, aboard the Santa Elena, the reader meets up with Pizarro as he sails from Panama and overtakes the little trading vessel at the outset of the novel. Born in England to a Canadian father and an English mother, Ronald Wright studied archaeology at Cambridge University and the University of Calgary. He contributes to the Times Literary Supplement and presented Canada’s Massey Lectures in 2004, published as A Short History of Progress. 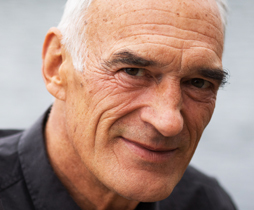 Having moved to Saltspring Island from Alberta, Ronald Wright was one of four nominees for the first $25,000 British Columbia Award for Canadian Non-Fiction in 2005. His first novel, A Scientific Romance, won Britain’s David Higham Prize for Fiction. He has been published in more than fifteen languages and more than forty countries. A Short History of Progress. Toronto: Anansi, 2004; New York: Carroll & Graf, 2005; UK: Canongate, 2005. Henderson’s Spear. Toronto: Knopf Canada, 2001; London: Transworld, 2001; New York: Holt, 2002. Home and Away. Toronto: Knopf Canada, 1993. Stolen Continents. Boston: Houghton Mifflin, 1992; also Toronto: Penguin Books Canada Limited. Time Among the Maya. Toronto: Penguin Books Canada Limited, 1989; also London: Bodley Head; New York: Grove Weidenfeld. On Fiji Islands. New York, London, Toronto: Penguin Publishing, 1986. 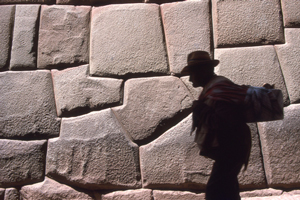 Cut Stones and Crossroads: A Journey in Peru. New York, London, Toronto: Penguin, 1984. David Higham Prize for Fiction, 1997, for A Scientific Romance. Honorary Doctorate, University of Calgary, 1996. Gordon Montador Award, 1993, for Stolen Continents. CBC Literary Award, 1991, “Going to the Wall”. Shortlisted, Trillium Book Award, 1990, for Time Among the Maya. Canadian Science Writers’ Association Award, 1986, for “The Lamanai Enigma”.